Whole Foods is no stranger to superfluous, expensive products like a pack of dried mango for $12.99 or $6 asparagus water. But these pre-peeled oranges go too far. Yes, Whole Foods finally managed to go too far. Bougie-grocery-store shopper Nathalie Gordon tweeted out a picture of the insane product at her local store, noting the waste of plastic used to cover a fruit that already has a natural cover. It's also worth noting these are not just ordinary oranges, but Sumo mandarin oranges, which are more rare and pretentious. However, they're still oranges, meaning they're not difficult to peel. — Nathalie Gordon (@awlilnatty) March 3, 2016 Yeah, that's bad. Whole Foods realized its faux pas pretty quickly though, and tweeted an apology stating that it's pulling the item from shelves. — Whole Foods Market (@WholeFoods) March 3, 2016 Mark it down: 2016, the year when a company figured you were too lazy to peel an orange yourself. 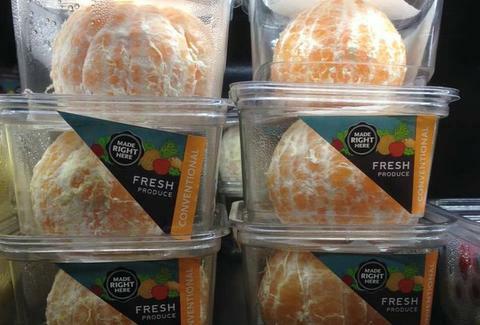 Whole Foods wasn't wrong -- but that doesn't make pre-peeled oranges right. Kara King is a News Writer at Thrillist and frequents the Whole Foods deli. Send news tips to news@thrillist.com and follow her at @karatillie.